Multi-vehicle SLAM offers promise of efficient exploration by groups of mobile robots working cooperatively to pool their mapping capability. Most prior research in the SLAM community has focused on the case of single-agent mapping and exploration. While these techniques can often be extended to a centralized multi-agent framework  (provided that there are no communication bandwidth restrictions), the extension of single-agent techniques to a decentralized multi-vehicle SLAM framework is often not obvious nor appropriate. Much of the previous research in the area of distributed multi-vehicle SLAM has focused primarily on terrestrial (i.e., land and aerial) applications     , where high-bandwidth radio communication is possible; however, underwater communication bandwidth is distinctly limited from that on land . The speed of sound in water is 1500 m/s, which is 1/200,000 that of the speed of light! Moreover, it requires on the order of 100 times more power to transmit than it does to receive, making acoustic transmission and reception asymmetrical for medium access (MAC) schemes . Half-duplex time division multiple access (TDMA) networks are usual, with typical acoustic modem data rates ranging from 5 kbits/s at a range of 2 km (considered a high rate), to as little as 0.080 kbits/s (a low rate). 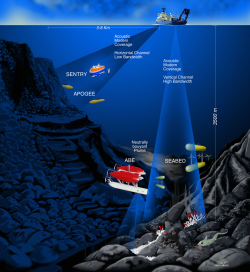 The low acoustic data rates are not simply a limitation of current technology�the theoretical performance limit for underwater acoustic communications is 40 km� kbps (i.e., a max theoretical data rate of 20 kbps at a range of 2 km, for example). Therefore, any type of multi-vehicle SLAM framework must adhere to the physical bandwidth limitations of the underwater domain. PeRL's Gen2 PPSBOARD provides a stable subsea time reference for AUVs. During his postdoctoral work, Eustice et al developed a synchronous-clock acoustic modem-based navigation system capable of supporting multi-vehicle ranging  . The system consisted of a WHOI Micro-Modem   (an underwater acoustic modem developed by Woods Hole Oceanographic Institution (WHOI)) and a low-power stable clock board designed by Eustice called a PPSBOARD. This system can be used as a synchronous-transmission communication/navigation system wherein data packets can encode time of origin information as well as local ephemeris data (e.g., x, y, z positional data and error metric). This allows for the direct measurement of inter-vehicle one-way travel time (OWTT) time-of-flight ranging. The advantage of a OWTT ranging methodology is that all passively receiving nodes within listening range are able to decode and measure the inter-vehicle range to the broadcasting node. Distributed Navigation with Ranging: PeRL is investigating probabilistic fusion methods that will scale across a distributed network of multiple agents who have limited communication bandwidth in a non-fully-connected network topology. The proposed acoustic-modem augmented navigation framework will exploit inter-vehicle OWTT ranging to supplement perceptual SLAM localization while reducing the need for state communication. 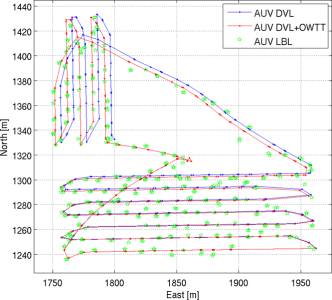 OWTT AUV navigation results show drift-free absolute positioning comparable to acoustic beacon-based LBL. Sponsor This material is based upon work supported by the National Science Foundation under Grant No. IIS-0746455. Any opinions, findings and conclusions or recommendations expressed in this material are those of the author(s) and do not necessarily reflect the views of the National Science Foundation (NSF).